IT WAS ONLY MY SECOND day in Medellín, Colombia when a group of students from my Spanish school planned a day trip to explore the area. Apparently, they heard about a scenic group of hiking trails and waterfalls along the Aburrá valley high above Medellín. They arranged a hike, and I joined in, anxious to see more of this interesting place. We took a local 10-seater bus heading up to Arenales, a community which is just a short 20-minute drive up the mountain range. From there, we walked towards a path leading through the hills. Within minutes, we were surrounded by emerald-green rolling pastures, which quickly descended into a quiet, tree-lined river valley. We heard the faint sound of surging water in the distance – it was a 30-foot waterfall gushing with crystal clear waters into adjacent pools. What a spectacular sight! We stopped and admired the view before we trudged onward to find the second waterfall higher up the range. Two hours later, we were deep in the woods, with no sign of the falls. We were lost and had to decide what are next move would be. We heard voices off in the distance and decided to follow them, in hopes of navigating back to our original path. The first waterfall on our hike outside Medellín. Brandon smiled and realized where we were. We had stumbled onto the former prison of the late Pablo Escobar, the notorious and dangerous drug lord of Colombia. The prison is now a tourist stop. Colombia, particularly Medellín, had evolved from its dark past and is presently in an era of transformation. Visitors like me could enjoy a peaceful time here, leaving me optimistic about the exciting travels ahead. Those first few days in Medellín turned into a four-month adventure with my wife in January 2016. 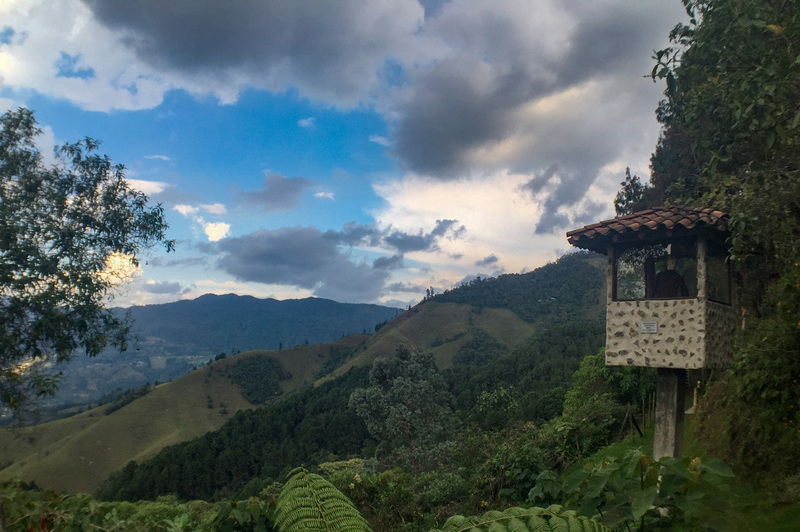 Colombia now occupies a special place in my heart and even though it’s been only three months since I left, I can’t help thinking about all the optimism surrounding this beautiful country. I now feel that Colombia is calling me back, and here is why. An afternoon view of downtown Medellín in the Aburrá valley. Medellín was once considered among the most dangerous places, yet it’s now becoming recognized as one of the most innovative cities on earth. We were curious how a place has created this kind of positive change, and after spending a short time here, we discovered the impetus. During the most difficult years, extensive government funding was poured into the development of parks, schools, education, art, culture, and a world-class transit system. Add to these infrastructures are the citizens who exude immense pride for their home, and action to improve it, which equals a good formula for change. 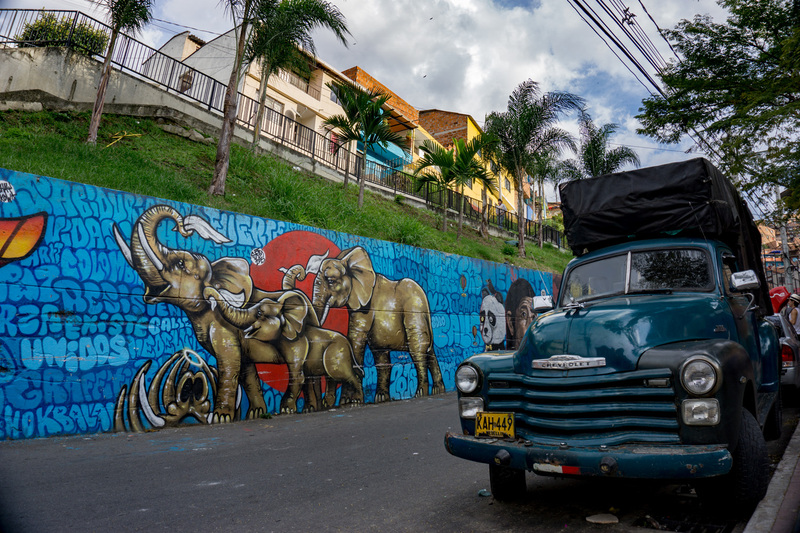 Medellín’s tourism is booming, and start-ups are launching left and right. 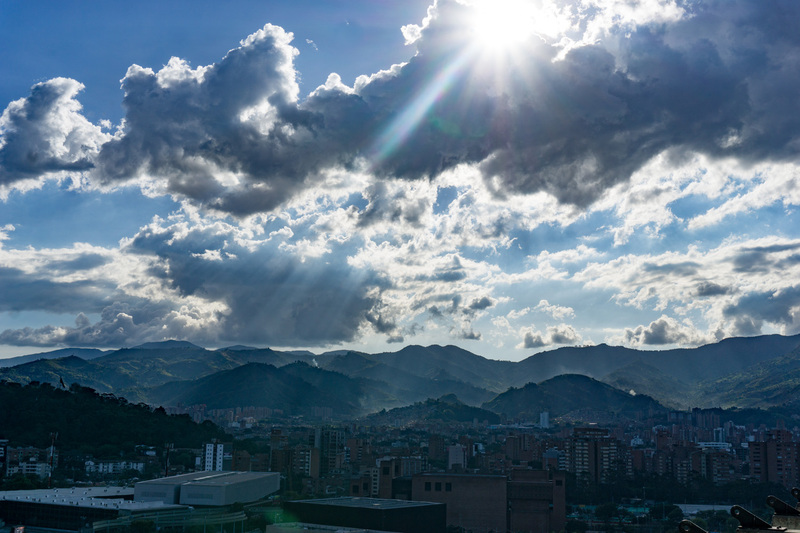 Medellín has become an optimal location for expats like us, looking for a city to work online as digital nomads. Graffiti commemorating the white rags raised by residents during Operation Orión. As the shopkeeper handed me my change and a fresh, hot empanada, she noticed I was admiring the graffiti on the wall right across from her bakery. She explained, “This is about solidarity and peace in Comuna 13.” Not understanding her comment, I later looked up online the meaning of the mural. On October 16, 2002, a military strike to overthrow rebel groups in the area descended on this neighborhood. Nine people were killed, while hundreds were wounded. The siege made the roads impassable for the wounded inhabitants to seek medical attention, and the community took to the streets in solidarity by flying white rags. With that action, the fighting stopped. Now I understood the significant stories the graffiti conveyed around the city. Medellín’s cable car system for daily transit. In some countries, this is a gondola that lifts skiers up a mountain to the ski slopes. 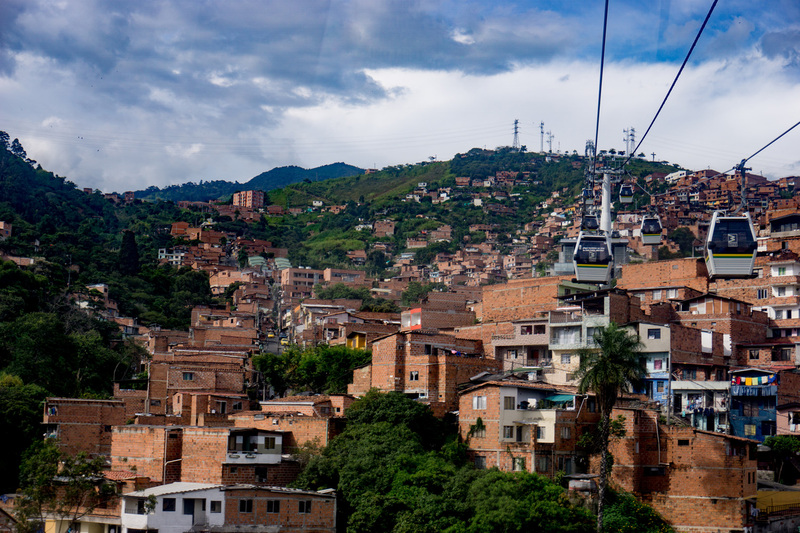 But here in Medellín, it’s the Metro Cable, the regular transit that created the city’s greatest accomplishment: accessibility for everyone regardless of socioeconomic status. This was evident when my wife and I got on a cable car and we were joined on it by a young family carrying their shopping bags as they headed home to the Santa Domingo district. The entire transit system was clean, well-cared for, and never vandalized, the citizens are clearly proud of its existence. 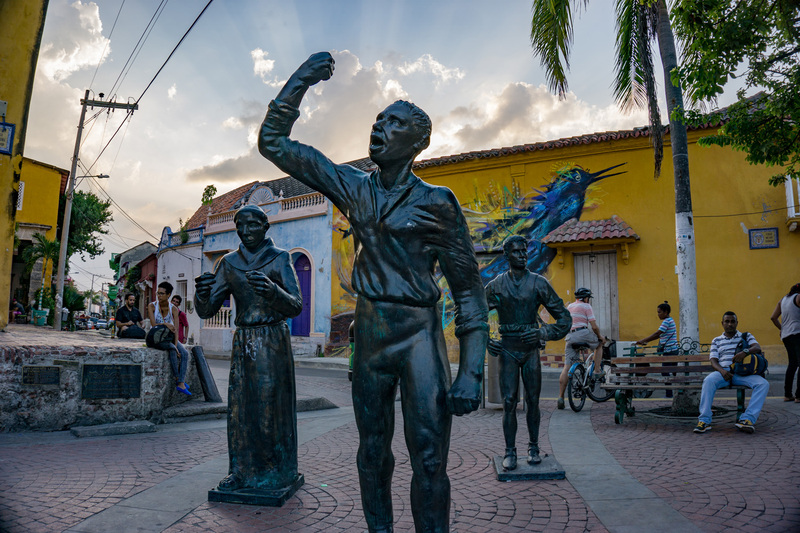 The statue of Pedro Romero, hero of Cartagena’s independence movement, Plaza de la Trinidad, Getsemani, Cartagena. Outside Cartagena’s walled city lies one of the vibrant and authentic areas — Getsemani. One Saturday afternoon, we sat on the benches around the Plaza de la Trinidad watching local children playing soccer while their families cheered them on. When dusk arrived, chairs were set up in the plaza to start a movie night, as Spanish films were cast on the door of the cathedral. We sipped on our beer watching and thinking what a great place this was to spend our Saturday. 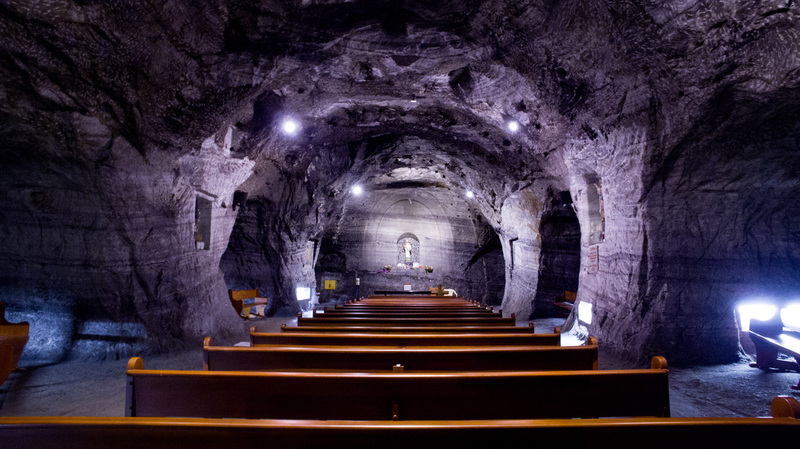 One of the underground chapels in the Salt Cathedral. We were a little reluctant to visit the busiest tourist destination in Colombia, but we were curious about it. We drove an hour outside of Bogotá to the underground Salt Cathedral in Zipaquirá, a cathedral built 200 meters below the ground in a salt mine tunnel within the Halite mountains. Despite the crowds, we found ourselves on a pew in one of the 14 underground chapels, surrounded by rock and intricate salt and marble sculptures, as a purple glow cast on them. This place was better than we had imagined and we were surprised by the calmness and peace it brought to our day. As I made my way through Bolívar Square with my lunch in hand, I didn’t realize I would draw this much attention. Not from people walking by, but from hundreds of pigeons that followed my every move. Throughout the day, the central public plaza in Bogotá, including the buildings of the Supreme Court and Congress, was a busy area with hundreds of people heading to work and walking to and fro. Vendors were selling all kinds of snacks and sweets that attract pigeons by the thousands who come to feast on the crumbs. 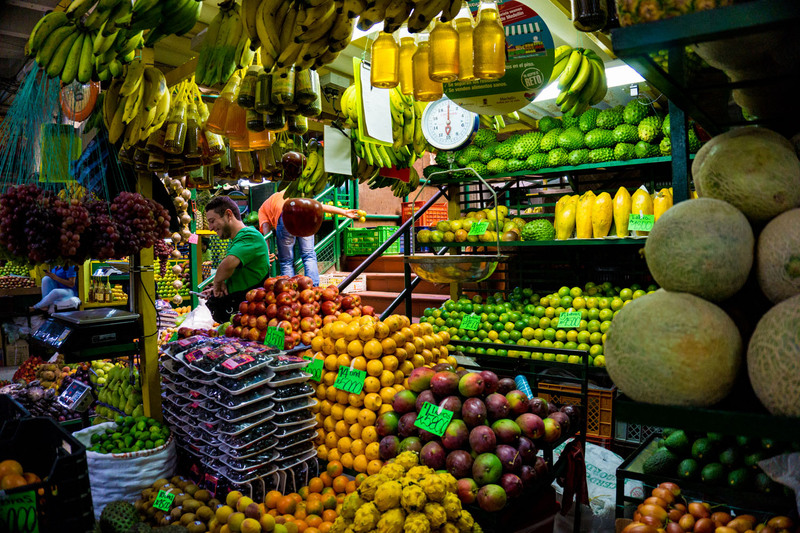 One of many fruit markets in Colombia. Apart from football, one of Colombia’s national treasures should include its fruit varieties. In northern climates like our own, we have such a short season for fresh home-grown fruits, but not in Colombia. Fruits grow all year long. Sweet fruit juices and smoothies are an essential part of the diet, and some of these fruits are so unique, they are only found in Colombia. No taste could compare with a slice of the freshest papaya and the juiciest pineapple at this market. I felt like a kid again as I tasted new flavors that I couldn’t identify for the first time, such as Guanabana, Lulo or Granadilla. 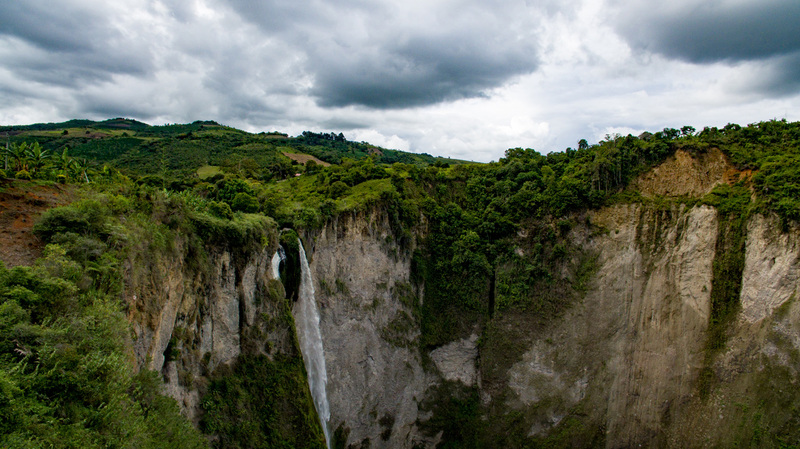 One of the incredible waterfalls outside San Agustín. My wife and I traveled slowly down south through Colombia to see as much of the country as possible. On our way down, we decided to stop in San Agustín to visit the largest archeological site of pre-Colombian tombs. After a jarring bus trip from Popayán, our friendly tour guide, Manual, met us by car to show us around. Before we knew it, we were surrounded by jaw-dropping cliffs, dramatic waterfalls, thick green forests and rushing rivers below us. This place has the most understated reputation where beauty is both natural and man-made. 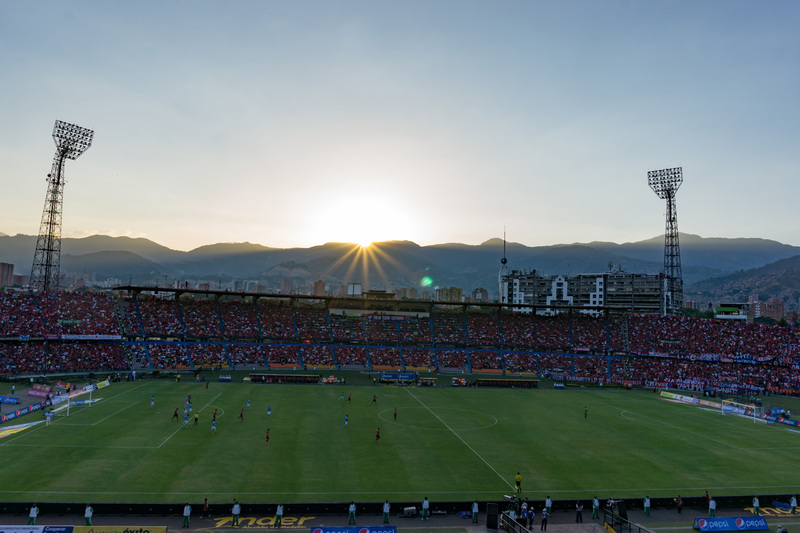 When my Spanish teacher, Daniel, wanted to share his pride for Colombian football with us, we jumped at the chance to go to a game between his team, Independiente Medellín, and Junior from Barranquilla. We knew how passionate Colombians were for football (soccer in North America), but we didn’t anticipate such an electric game day. The atmosphere included 30,000 roaring fans wearing red jerseys, scarves, and hats, banging drums, and singing original team songs during the entire game. The field exploded with smoke canisters that streamed blue and red through the air, while cheerleaders paraded on the field. The fans screamed at the referees in disappointment as their team lost the game, but we were incredibly entertained. 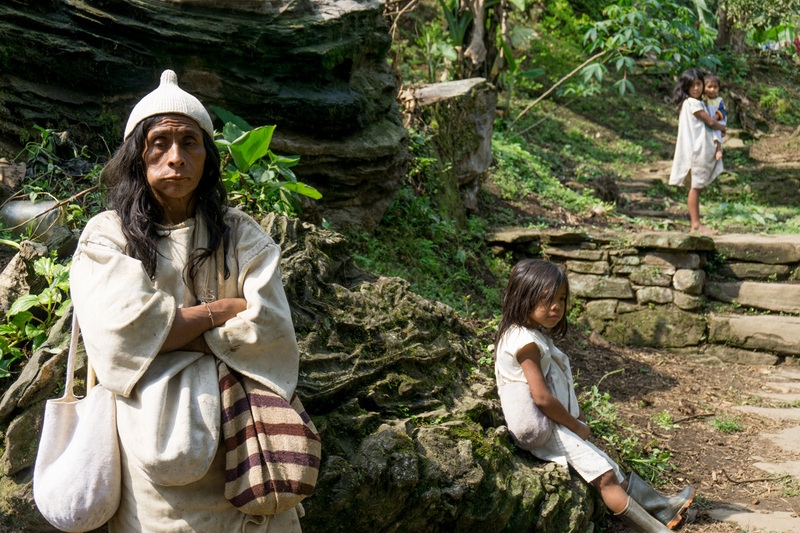 The Kogi Mama, Spiritual Leader of the Kogi tribe outside his home. 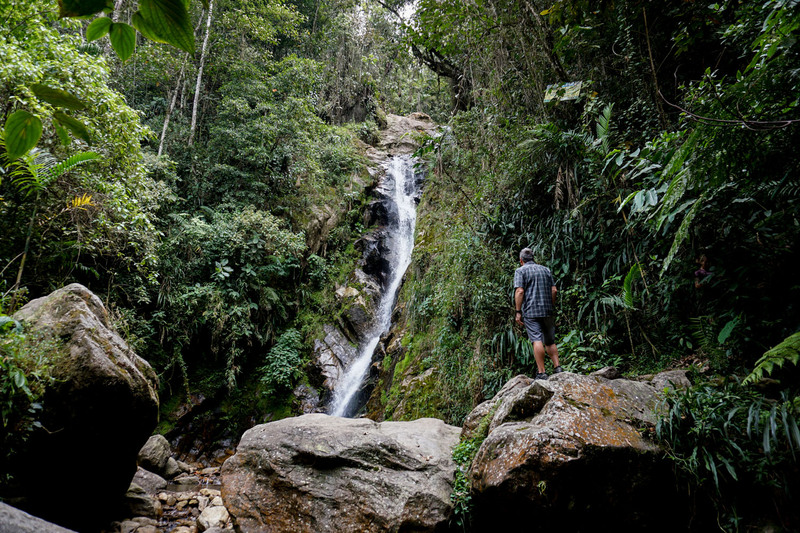 We traveled to Northern Colombia and joined a group of ten people in a four-day Lost City hike in the Sierra Nevada of Santa Marta mountains. On the trail, we encountered the Kogi people, the indigenous population that were living in the area and were still keeping up with their traditions. The Kogi Mama, the spiritual leader, known to be the enlightened one with a “sixth sense,” agreed to take questions from our group. With his cheek stuffed with Coca leaves, the Kogi Shaman, answered my question when I asked, “What are your views of the world today?” “Our people believe mother earth created the world,” the Shaman started, “and if there is destruction in one part of this area, this same result will echo many miles away. Once, mountains were white-capped, but now they are brown and barren. Lakes are drying up, trees are dying, mountains are deforested, I believe the human race will need to vacate the world to another planet, to survive.” Our group fell silent upon hearing his remarks, and we were moved by them, feeling a greater appreciation of our damaged, yet fragile, ecosystem in the world. Chorro de Quevedo, Plaza in Candelaria district, Bogotá. 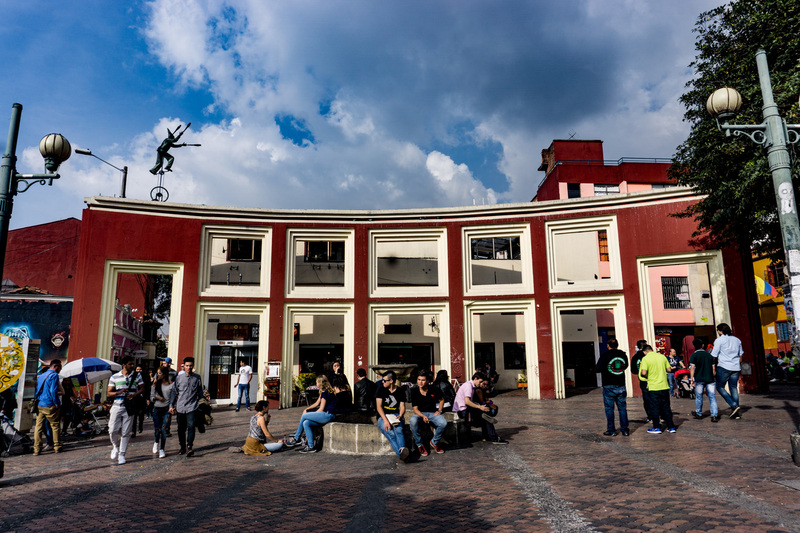 The Chorro de Quevedo is a plaza in Bogotá that is believed to be where the city was founded in 1538. The structure here represents twelve households, to commemorate the first homes in the city. 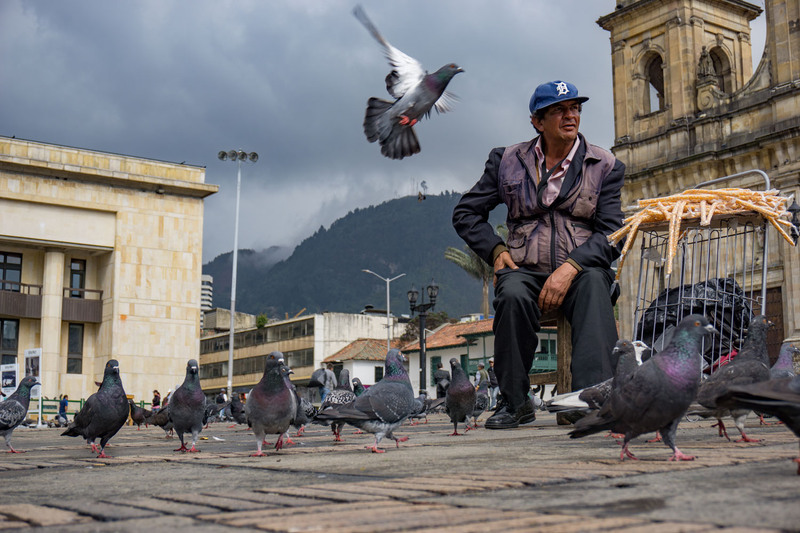 Throughout the years, Chorro de Quevedo, also known as the fountain of stories, has witnessed the daily life of people in Bogota as they converge here to exchange tales, secrets, and anecdotes. Even to this day, the plaza is lively and creative, where you can find street performers, storytellers, and poets sharing their craft. It was entertaining just hanging around the plaza, watching the Bogotan vibe unfold before us. La Piscina (The Pool) – Tayrona National Park. 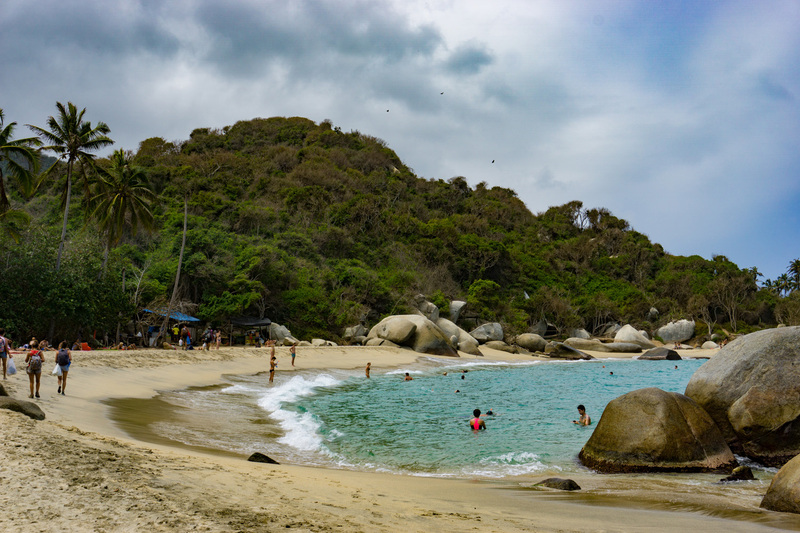 “Jurassic Park” was a common term we heard to describe Tayrona National Park. This enormous 13,000-hectare area is a carefully manicured garden with walkways and railings to guide you through the area; yet, it is also raw with jungle, mangroves, beaches, and wildlife. It’s so big you need to plan your day to get back to the gates before they close for the night at 5 pm, or you may end up sleeping in a hammock under the stars, which is not a bad consequence after all. Top of the Rock – La Piedra in Guatapé. When it comes to climbing mountains, my wife and I have the worst of luck, as we always end up seeing only clouds at the top. 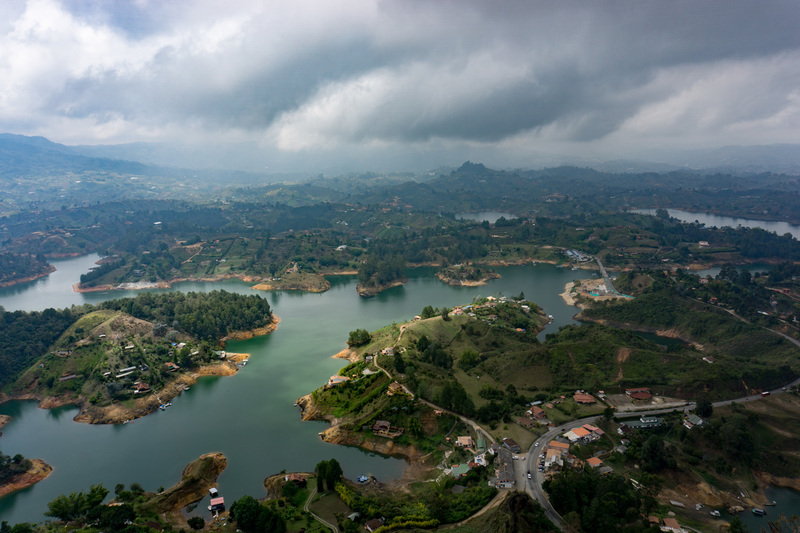 On a day trip to Guatapé, we endeavored not to miss the best and only spot to view the lake, the Piedra, or the Rock. After a 700-step climb up the brick staircase, we saw only clouds, much to our dismay. With a little patience, we waited at the top, while we enjoyed a cup of sliced green mango sprinkled with salt that we bought from a vendor. And then the sun peaked out to illuminate this grandiose view of the lake. It was more than enough reward to get to the top.